I’m surprised that I haven’t gotten around to posting this yet. 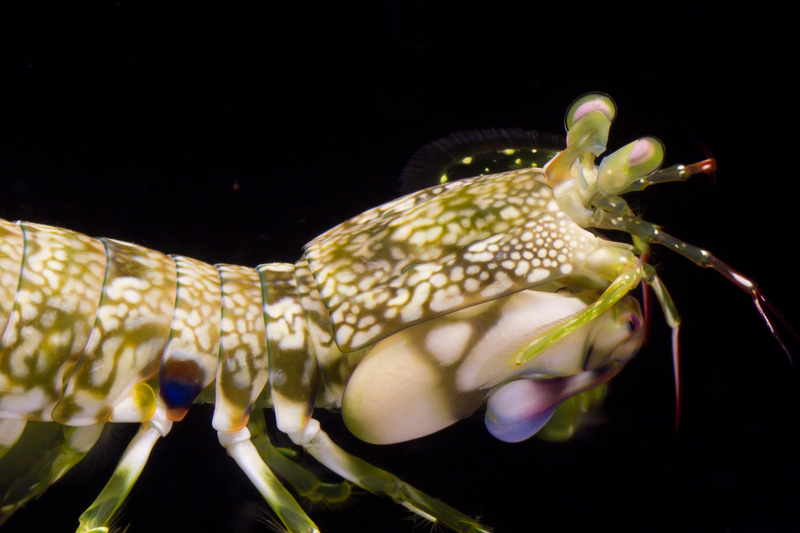 Here is one of my favorite mantis shrimp videos of all time. 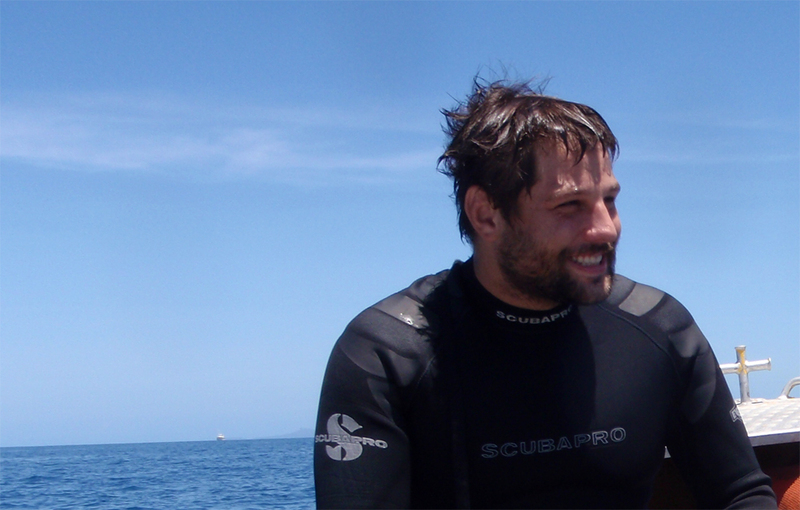 Also, check out Dr. Caldwell’s youtube channel for more great stomatopod videos. In contrast to the pretty and placid G. playtsoma, today I have a photo and video of one of the meanest mantis shrimps I have encountered. Gonodactylus chiragra occurs in the same intertidal reef flats as G. playtsoma, but its temperament is the polar opposite. It hits hard and often. Its coloration is a mottled brownish-yellow-green on creme; except for bright orange and yellow accents on the antennae, mouthparts, and walking legs. Here is a quick video of G. chiragra, whalloping the wall of its aquarium; attempting to hammer my finger (off-screen). It plays at regular speed and then at one-tenth speed (the slow-mo is much more impressive and/or comical, in my opinion). 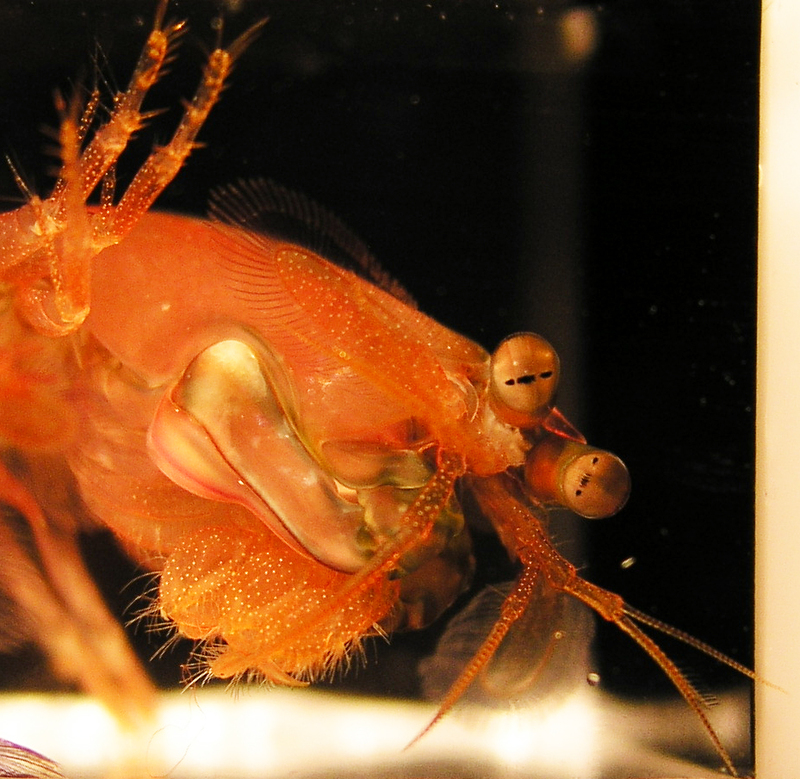 If you want to know more about the astounding stomatopod strike, check out my previous article: Why Stomatopods are Awesome, I: Super Strength. This was my first attempt at editing together a video, and I will hopefully have more content like this in the future. I first saw this species of stomatopod in the field this year. They are really beautiful animals, with subtle but vibrant color accents on their dactyls, antennae, eyes, and on the edges of some of their somites (body segments). This individual is about 72 mm in length, and the species seems to be fairly docile (for stomatopods). 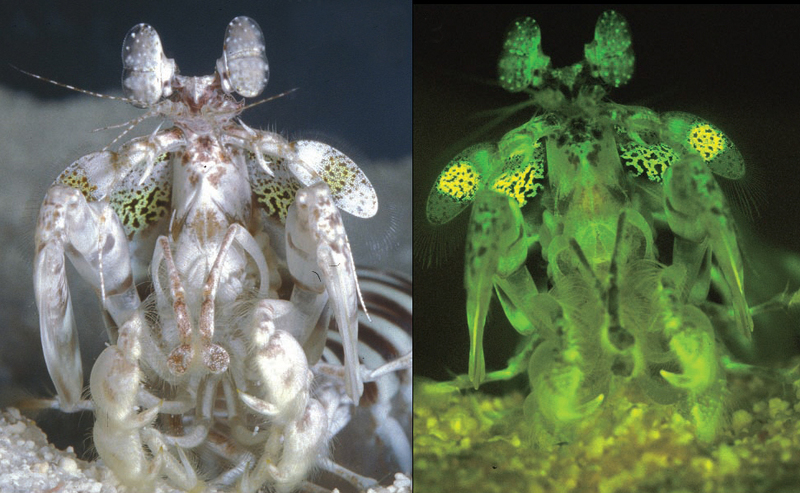 I talked previously about fluorescence in stomatopods here. However, I don’t know if the patterns on G. platysoma are used to amplify any particular signals. These animals live in shallow water and would have less use for fluorescent signal amplification. Disney Nature has a new IMAX documentary out titled, ‘Oceans‘. 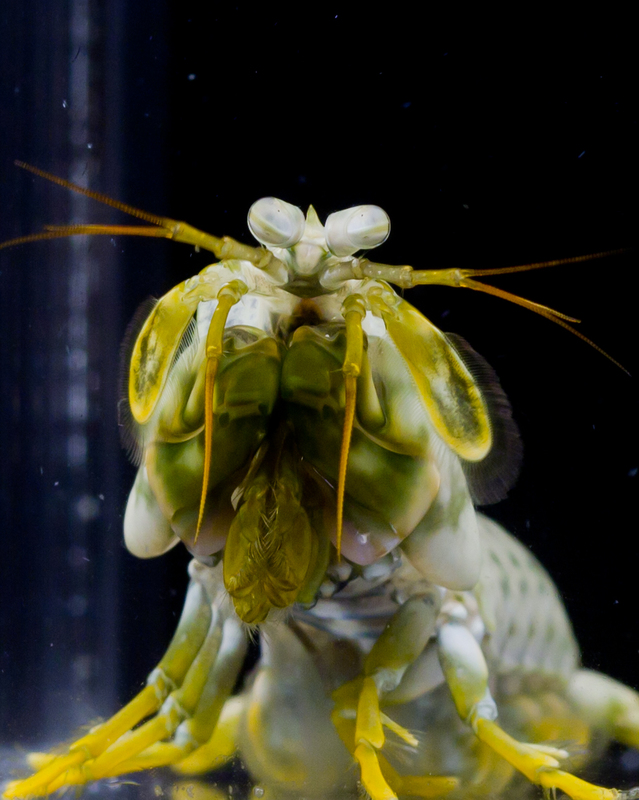 A quick survey of the reviews of the film indicates that a mantis shrimp, Odontodactylus scyllarus, is a part of the most memorable sequence of the film. Here is a clip of the mantis shrimp’s scene, (available in 1080p on Youtube). Near the beginning there is a really nice shot of the pseudopupil (the facets of the eye looking directly at the observer). I, however, have a couple criticisms of this sequence. First off, this was almost definitely shot in an aquarium. Secondly, what is it with IMAX movie makers and repeatedly pushing animals towards stomatopod burrows until they lash out? Similarly to the sequence from ‘Deep Sea 3D’ where an octopus is forced to approach the burrow of a Hemisquilla californiensis, the mantis shrimp in this video shows no interest in predating the crab. He just seems to be trying to get the crab away from his hole. Normally, the crab would surely oblige if it wasn’t for the Disney filmmakers repeatedly pushing it back. I can’t help but be reminded of Disney’s ‘White Wilderness‘ documentary where the filmmakers pushed lemmings off a cliff into the ocean in order to convince people, incorrectly, that lemmings engaged in suicidal behavior. They are quite a viscous bunch over in the Magic Kingdom. I haven’t had much time to write this week on account of wanting to graduate someday. Here is one of the animals that I’m working on at the moment. N. bredini is the easiest mantis shrimp to find on the east coast since they commonly hitch-hike on reef rubble, cultured in Florida for the aquarium trade. The photo above shows the ‘smasher’ raptorial appendage nicely, as well as the black pseudo-pupil (the facets of the eye that are directly facing the camera). These guys come in a bunch of different color morphs including the rusty color above, green, and grey mottled. I’m trying to improve my photography skills, but the old Olympus C-5050 I’m using isn’t cutting it any more. It’s no fun trying to manually focus on a moving critter using a 1.8″ 110,000-pixel screen. Edit: Correction, this animal is actually N. wennerae. This species is physically indistinguishable from N. bredini. The only reliable determinant other than genetics is habitat depth. I haven’t been able to post any hard science this week since I’ve been working on a presentation for my department’s annual symposium. So far, this is the largest audience I have presented my work to. I thought I might quickly share one of my slides from that presentation as a preview for a much larger future post about the ridiculously complicated mantis shrimp visual system. This is a comparison of photoreceptor classes in human and mantis shrimp retinas. Each photoreceptor class has a distinct wavelength sensitivity curve. On the human plot, you can see our three cone photoreceptor classes; blue, green, and red. These receptors cover the electromagnetic light spectrum between 400 nm (violet) and 700 nm (red). Our brains are able to process relative stimulation between the three cone photoreceptor classes, allowing us to differentiate many colors. 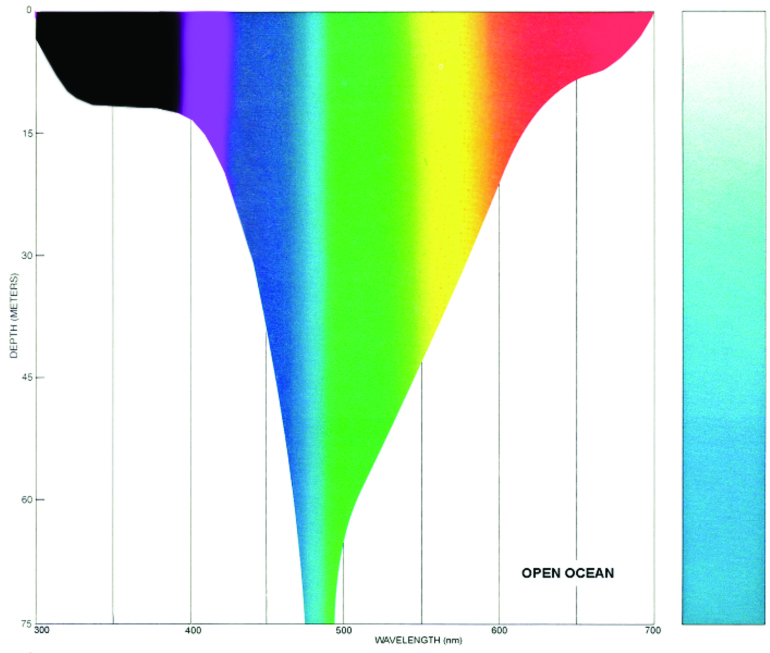 Mantis Shrimp don’t have the advantage of a large brain for downstream processing, so they take another approach to seeing many colors: They have 16 distinct photoreceptor classes, packed via optical filtering into tight slivers of the spectrum. Of these, five classes are sensitive to UV light, below our visual range (these are the receptor classes that I am attempting to characterize). 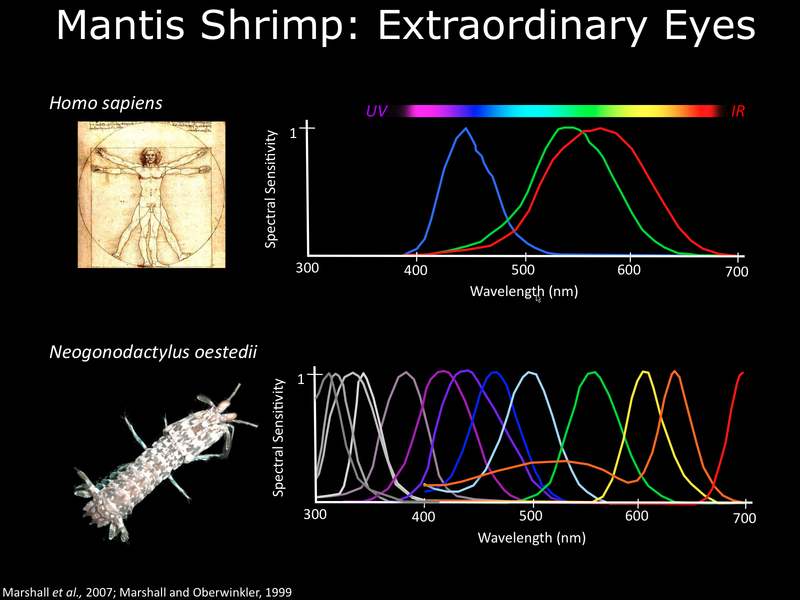 In addition, not shown in this slide, mantis shrimp can discriminate linearly and circularly polarized light. Stay tuned for an in depth mantis shrimp vision post at some point.